I've pulled out one of those put-aside rugs. 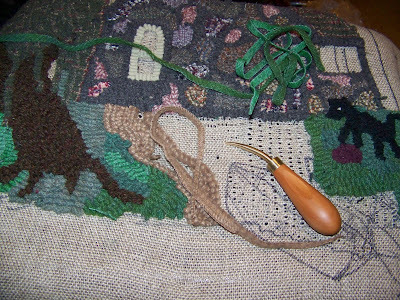 It's a pictorial/memory rug, a picture of the old stone cottage on Big Lake, near Davisburg, Michigan. The cottage was hand-built in the early twentieth century by the Thielmans, the in-laws of my uncle's wife's sister. Back then, the city of Detroit was like a small town, everybody knew everybody or knew their relatives or neighbors and my mother had a friend who married one of the Thielmans, and that friend's sister married my uncle - anyway, that friendship must be how my family was able to have the cottage every summer during my childhood. We used to spend our summers there in the late 1940s and early 1950s - and even back then, it was full of antiques and was basically an antique itself. The kitchen was outfitted with running water through a hand pump next to the sink - it was necessary to keep a glass of water by the sink to prime the pump. There was also an ice box, an ice box that held big fifty pound blocks of ice that was delivered every so often. I remember an ice wagon pulled by horses, but that might just be my imagination, and I also remember a truck built like a milk delivery truck with cold ice water draining out of the back. The children slept in a large room upstairs that was fitted out with a collection of old brass beds. The living room had a pot bellied stove that we sat around on cold, rainy summer days. There was a day bed over in one corner, by the window I've put in the rug, and that's where my mother read to us every afternoon. My strongest memory is of learning to read by watching her read Black Beauty to us. I've tried several wool colors for the lawn in front of the cottage and haven't been happy with any of them, so I decided to take all the colors I was using, add some more green wool, and marry the colors together. Also, just to experiment, I added some strips that had already been cut. 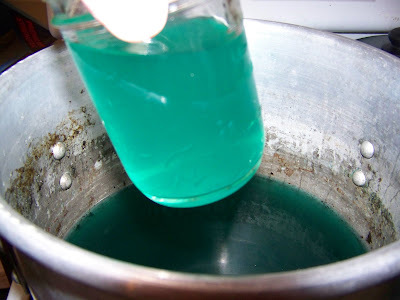 Once I simmered the wool in a pot of water and added vinegar to set the color, I pulled the wool out of the pot. Most of the real green had already been used up and the color that was left was a blue-green, with more blue than I wanted in my lawn. Experience has shown me that blue is one of the slower colors to be taken up by wool and I knew I didn't want much of that blue. 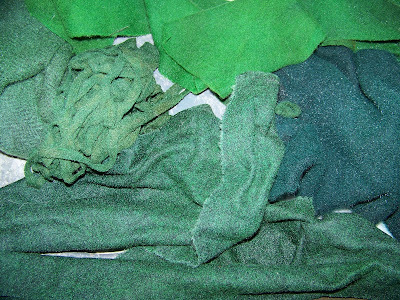 The photo above shows the wool after it was pulled out of the pot - the bright green at the top were my bleeders, the strips on the left started out as a very light yellow green (I call it puke green), and the wool on the right is from a recycled coat and that must be the wool that provided the blue-green. I still have to rinse and dry the wool. 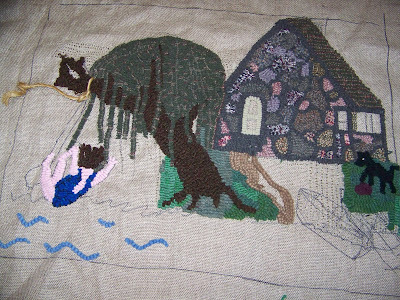 After that and after hooking the lawn, I'll have to start on the water and sky colors. I decided I want all of the wool to be textured, so I may have to set up a pot of blues to bleed so I can marry some of the same textures together as blues. I hooked myself jumping from the rope swing before I decided on all textures, but I'm not going to rehook my pink arms and legs. It is fun to hook a memory rug of this sort, I keep drifting off in old memories - like my brother and his friend chasing me and throwing fish eyeballs at me, or going out in the rowboat with lunches packed by my mother that included milk in pop bottles, and my dad coming home from the office and taking us swimming and throwing us off of his shoulders. I have one regret, we used to throw our garbage in the swamp next door, long before we thought there was anything wrong with doing that. I guess we didn't do any long-term damage, the swamp is all gone now anyway, buried under several houses.